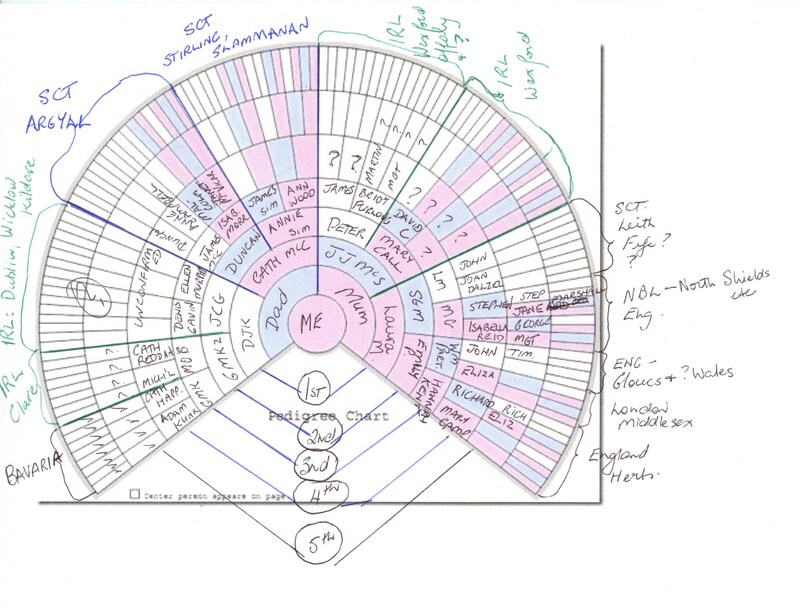 Follow the pretty pink lines for X-DNA. I’ve mentioned before that I’ve had my autosomal DNA tested through Family Tree DNA. It wasn’t until a 2nd cousin had hers tested and Mum also agreed to being tested too, that my results started to provide some clues to the past. There’s still heaps to do and I’m still pretty confused, but a few of the closest links are looking like they tie back to/through my Callaghan ancestors in Wexford. Some link to both Mum and to me, but others only to Mum. My conjecture on the latter is that either (1) the DNA jumble has given them some of the DNA segments of Mum’s that I didn’t inherit –after all Dad had to get a look-in with 50% OR (2) they are further back in the line from me so the common segments aren’t large enough. The Callaghan line is one I’ve done virtually nothing on, for no reason that I can explain. Mary Callaghan married Peter Sherry (later McSherry) at St Michael’s church in Gorey, Wexford on 27 February 1881 and the witnesses to the wedding were John & Kate Turner. A few years later Peter and Mary would follow his parents and siblings to Australia. I must admit from time to time I’ve wondered if any of Mary’s siblings also followed them. 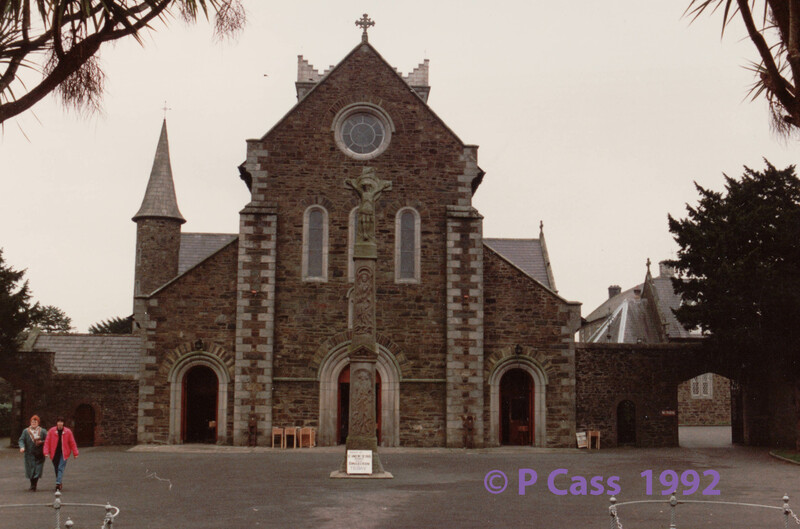 St Michael’s Catholic Church, Gorey, Co Wexford where my Sherry family were married and baptised. © P Cass 1992. All I know so far of Mary’s ancestry (from her marriage entry) is that her father’s name is David and he was a fisherman. I had checked with the priest at Gorey who told me that the Callaghans had not been part of their parish. My hyphothesis then was that perhaps the family came from nearby Courtown, just 4 kilometres east of Gorey and a fishing port. Searching the National Archives of Ireland’s 1901 census shows three men named David Callaghan in Wexford, all living in Courtown Harbour. In fact the Household Returns show they are all in the same house of which the head is David Callaghan, a fisherman, 67 years old, Roman Catholic and illiterate. Living with him is his daughter Bridget, aged 33; his son, also David, aged 27 and a fisherman, David senior’s daughter-in-law Kate, a widow, aged 37 and their son David #3, aged 7. All are illiterate except Kate and the 7 year-old David. John, Patrick and James were all fishermen but they could all read and write, unlike David’s family. The Enumerator’s Abstract reports them as living in Courtown Village, Ballaghkeen North Barony in the parish of Ardamine. It was the enumerator’s House and Building Report (page 2), that alerted me to the fact that living next door to David’s family is John Callaghan and his family. From the household return John Callaghan is 62, living with his wife Catherine aged 60, sons Patrick 32 and James 23, and daughter Elizabeth Redmond 34, her husband James 35 and her daughter Mary. It seems likely, but yet to be proven, that John and David are related in some way. According to the House and Building report again, the houses in the Courtown Harbour village are predominantly of 2nd class standard, constructed of brick/stone with slate/tile/metal roofs, 5 or 6 rooms and 3 windows at the front. The Return of Out Houses and Farm Steadings show John Callaghan has 5 outbuildings, an unusually large number, which are reported as a dairy, piggery, fowl house, shed and store. This makes me wonder if he’s perhaps supplying the village rather than just his own family’s needs, as 4 households kept a piggery, 7 a fowl house but John was the only one with a dairy. Next door David Callaghan had no outhouses but his family occupied six rooms while John’s had only five. The standard of the village’s houses becomes apparent from a reference in Samuel Lewis’s Topographical Dictionary of Ireland: “several good slated houses and other buildings have been erected on the quay…” There is also an interesting local history which has some invaluable clues into life in the area over the decades[i].If you’d like to see some old images of Courtown they are available on the National Library of Ireland site here. Although the Courtown area had excellent fishing for many years, over time the industry diminished and that would certainly have affected the Callaghan men’s income generation and financial independence. By the time of the 1911 census, Kate is registered as the head of the household living her son Davi #3, with her father-in-law David, 82, and his daughter Bridget, 44. Kate is listed as a widow so David #2 has died between 1901 and 1911, perhaps at sea. I can find no record of his death in the Irish or English indexes[ii]. Having found John and David Callaghan living in adjacent houses in 1901, I wondered if their residence in the area was long-standing so I turned to the Griffith Valuations. 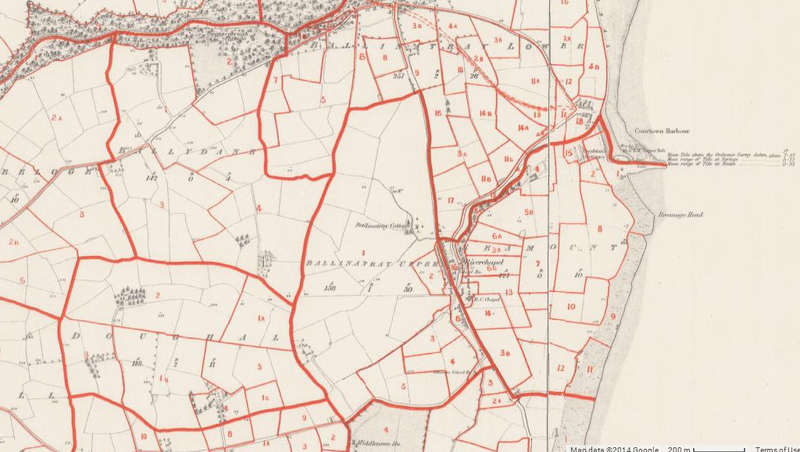 The Ask About Ireland site offers this wonderful resource with digital images and the original maps. Sure enough, there was an Anne Callaghan living in the village with a house and land of £1 per annum rateable value. Her landlord was John Oughton, the very person whom we know to have built the harbour-side cottages mentioned by Samuel Lewis. Also in the village was a John Callaghan with a house only, valued at £1 and also owned by John Oughton. No ages are provided by the Griffith Valuations and since Anne is the lease-holder it is most likely that she was a widow (though not necessarily). Perhaps it’s indicative of the declining fishing industry or just the life of men who survived the harshness of the elements, but the Callaghan crew make regular appearances in the Petty Sessions records in FindMyPast. At present the Gorey, Wexford records only cover the period between 1900 and 1911. I’m betting that when there are more released the Callaghans will feature again….I’ll certainly have my fingers crossed! So far the charges relate to drunkenness, drunk and disorderly, one charge of common assault by David Callaghan on John Callaghan (not prosecuted), and several for John Callaghan regarding non-payment of harbour dues. The beauty of these latter entries is that they refer to John Callaghan owning three fishing boats, Fame, Lizzie and Gance (?). I had also wondered if any of the Callaghans had joined the British Merchant Navy or the Royal Navy, especially during the years of World War I. I believe this entry for David Callaghan, born ~1891 is in fact the same David Callaghan living with his parents and grandfather in Courtown in 1901 and serving on HMS Tempest in 1915. Another invaluable entry is John’s excursion in Wexford gaol for drunkenness in 1883[iii]. He is described as a fisherman of Courtown and is 40 years old, consistent with his estimated DOB from the census. He is described as 5ft 7.5inches tall, with black hair, hazel eyes and a fresh complexion. Plainly the Callaghans hadn’t got on board the Temperance pledge started by Fr Theobald Matthew in 1838, which the nuns were still pushing when I was at school. I rather wish David had had a stint in jail as then there’d be a description of him…perhaps when the remaining petty session records, if available, have been indexed. Anne Callaghan also “got a guernsey” in the prison records [iv]. She was charged with larceny for the theft of a chemise and admitted to the Wexford Gaol on 3 August 1877. She was 5ft 2.5inches, with hazel eyes, black hair and a fresh complexion. She had no trade and it was her first time in gaol. She lived at Courtown Harbour making it pretty likely she is the same one mentioned in the valuations. (Although I sourced these through my FindMyPast world subscription, the indexes are also available on FamilySearch and the images can be seen at an LDS Family History Centre near you). Where to from here with this research? Well this is all very circumstantial, something I would always warn against, but I’m walking on the wild side here. Ultimately I need to check the Riverchapel parish records but these are not available through Family Search on microfilm or digitised, but only through the National Library of Ireland….a “to do” addition for my next Irish holiday whenever that may be. These are merely my hypothetical suggestions for one of my ancestral families with definite links, or rejections, to be discovered in the future. Come back later to learn more of their BDM chronology and a scandal that I discovered in Google books. I’ll leave you with an extract from a delightful poem, The Harbour, by Irish poet Winifred Letts. I wonder if this is how our Irish forebears felt, especially my Mary Callaghan McSherry. [i] The Windswept Shore, a history of the Courtown District. Kinsella, A, 1994. This entry was posted in Irish family history and tagged Callaghan, Courtown Wexford, David Callaghan, DNA, fisherman, Mary Callaghan McSherry by cassmob. Bookmark the permalink. Detailed and interesting post as per usual, Pauleen. Personal takeaway is that I had better get Mum’s DNA done – she is after all 91. Yes Jill, definitely get her DNA tested asap. You can always get more tests done once they have the sample, but if you miss the boat….I was surprised Mum agreed so readily but it’s made a big difference to making sense of my DNA.